I am not trying to offend anyone but, it actually looked pretty disgusting and it got me thinking about when I was that girl, sitting gnawing at the ends of my fingertips. Admittedly I did bite my nails out of anxiety or because I got carried away with a loose nail, I didn’t care much for my nails but complained when they never grew. I then moved and decided I was going to have acrylic nails regularly. I was getting older and noticed other women had amazing nails and I just wanted to make them grow. I do naturally have brittle nails but, it doesn’t mean they can’t grow but, it does mean I made a HUGE mistake. I had been growing out my nails for a few weeks before deciding to head on down to the local shopping center to get me some nails. Being an un-confrontational person I just allowed it, my nails would grow back, it didn’t matter. The problem actually came after my nails had been removed. My nail beds were so damaged they ached for weeks after. I could barely grow my nails and they just snapped at the sight of anything. I was so upset because I worked so hard not to bite them and it felt like I was back at square one. But, being me that’s where I took the bull by the horns and decided to never ever bite my nails again and let them grow, and that’s what I’ve been doing ever since. Invest in some nail base coat treatment. I use this one and have done for years but, anything that will replenish and grow your nail is perfect.A nail base coat will help you grow your nails and protect them from other polishes, should you apply them on top. Also, if you can see your nails growing and some progress starting you will be less tempted to nibble! It’s worth investing in a good quality nail file like this one. Every time you see a nick or a snag you can just pull out your nail file and file it away, instead of using your teeth. Your teeth damage your nail whereas a nail file keeps them on track and helps them from becoming ingrown. Get in to the habit of using every time you are tempted to bite. I still use this stuff now, because if I get stressed I head for my nails and because this tastes so disgusting it puts you straight off. You apply it as a clear coat or as a top coat and it will literally put you off for life and all life times to come. One thing that really discouraged me to bite was creating content for this website. I created a category called ‘Nail art’ not too long ago and because I do all the designs on my own nails, I can’t chance biting my nails and making them impossible to work with. Also, if you’re not in to nail art try investing in a few nice nail polish colors. You will less likely bite your nails knowing they are done. If you coat the polish with the stop biting polish too, you won’t be tempted to pick at the polish. Massaging your cuticles with coconut oil stimulates nail growth and will help them become stronger, it’s also great for your skin. It’s also a cheaper alternative to cuticle oil and them ‘nail growth pills’. Nail biting is a massive habit, one that is really hard to break no matter what age you are. But every time you go to put your hand in your mouth think about what you’re about to do and chew some gum or grab a mint to occupy your mouth. Of course some people are able to say ‘No! I quit!’ and never touch their nails again but, for some it can be a lot harder than that, so just know you’re not alone. If you have a bad day and chew off a nail, don’t fret about it just know not to do it again. It’s particularly hard if you’re like me and in times of stress it’s what you turn too but, it doesn’t have to be that way. Grab your nail file, chew some gum or even twiddle your thumbs, try not to head straight for the nail and think about what you’re doing first. Think of much your hands touch during the day, public restrooms, food, raw meat, dirty dishes, unwashed handrails and then all of them germs make their way in to your mouth. There’s also a ton of germs crawling around under your fingernails, and you chew them right up. Nail biting can result in damage to your teeth. It can chip and break them, all for the price of a nibble on your nail. Bacteria can also worm its way in to open sores around the nail and create puss which sometimes has to be surgically removed. Chewing and chomping at your nails can also cause irreversible damage to your nail beds, making them never ever able to grow again. 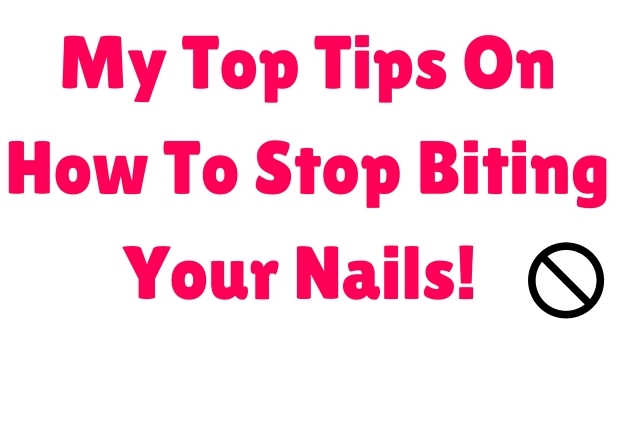 One last thing…do you have any stop nail biting tips?